Review by AllTheBestFights.com: 2016-07-20, some good exchanges between Shingo Wake and Jonathan Guzman but it is not enough to get three stars: it gets two. 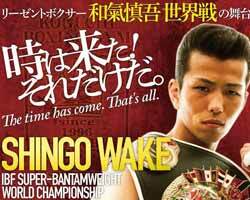 Shingo Wake entered this fight with a professional boxing record of 20-4-2 (12 knockouts) and he is ranked as the No.7 super bantamweight in the world (currently the #1 in this division is Carl Frampton). He suffered his last loss when he faced Takafumi Nakajima in 2012, since then he has won ten consecutive fights beating Waldo Sabu in 2016. His opponent, the undefeated Jonathan Guzman, has a perfect record of 21-0-0 (21 KOs=100%) and he entered as the No.10 in the same weight class. He has already fought once in 2016 winning over Daniel Rosas. Wake vs Guzman is valid for the vacant IBF World super bantamweight title. Watch the video and rate this fight!